The day started as it has ended. We could see the sun looking over the mountains in the east and it was heating the cold morning air as we stood in front of our lodge. Today we had to walk the longest part of our alps crossing and so we started very early. There was a Peak on our trail as well: The Pirchkogel at 2.828 m. We walked into the small village of Wildermieming and some school kids said a friendly good morning as we passed by. A golf court was on the right side and we came Obermieming and Untermieming. The trail led us over wet meadows into a small forest. We walked steep downhill on a forest trail until we stood in front of a long suspension bridge over the river Inn. We remembered the time in Nepal as we had to cross many of those bridges. But this one looked more save than the one we had to cross in Nepal. We crossed the bridge and we stood next to a noise Autobahn. There is an underpass next to the Autobahn. We took it until we stood in the industrial area of Stams. We started to walk fast to get away from the noise. We haven´t had some breakfast jet and so we searched for a supermarket. After 15 minutes we found a very small supermarket where we had fresh buns, sausage, cheese and coffee. After the breakfast we bought some food fort he next few days and walked into the center oft he village. On the left side we saw the monastery of Stams- The Stift Stams. The monastery was built in 1273 and is worth a visit. But we haven´t had enough time and so we walked further. Stams is only 572 m over sea level and so we had to make a lot of altitude today. Right after the village we had to walk seep uphill and the trail guided us higher and higher next to the slope. 2 ½ hours we reached our intermediate goel – The Stamser Alm. This lodge is placed on 1.880 m right next to a hunters cabin owned by the Stift Stams. The Alm is high frequented in main season but we where the only guests. We had coffee and an very delicious cake. The host tried to make us stay here over night but we wanted to reach the Dortmunder Hütte before sunset. We left the Stamser Alm behind us and passed a flock until we stood in front of Bährlehen-Kreuz (A cross) at 2.100 m. From there we had an amazing view down in the Inntal valley. But we couldn´t stay for longer. We had to make it to our first peak on the tour. 20 minutes later we passed an old snow field from where we could see the peak for the first time today. And than it happened: The trail was buried by debris. The only thing we could do was to cross the debris carefully. 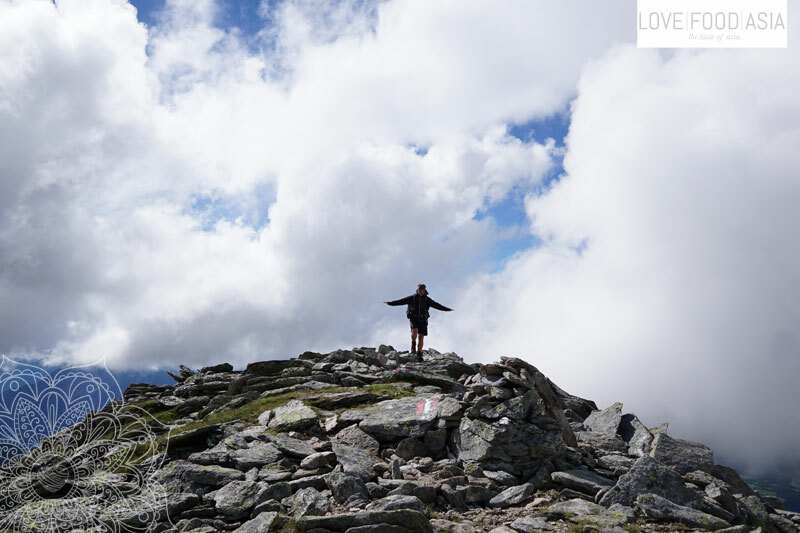 W had to concentrate hard and after another 45 minutes we stood on top of Pirchkogel at 2.828 m. It was very cloudy but we where happy that we made it to the peak after 6 ½ hours. After we wrote a quote into the peak book we stared to walk down to Kühtai. We passed the Hinteren Grieskogel and walked down to the lift Kaiserbahn above Kühtai. On the last 45 minutes we had to walk steep downhill and we already could see the Dortmunder Hütte. The DAV lodge is placed on the edge oft he village. Kühtai once was a very small farmer village but nowadays it has become a winter tourism spot. There is one hotel next to another and they are still building new hotels. After 9 hours of walking time we stood in front of the Dortmunder Hütte. We booked a simple room and enjoyed the warm shower. After we where refreshed we ordered a mountaineer meal and a beer. I think we looked very hungry and the host brought us a big portion of spaghetti Bolognese. After the dinner we had some good conversations with other guests. We also ordered another 2 or 3 beer because we knew that we had to walk a short stage tomorrow.